Brexit: utopia, dystopia or PONCE? Okay, here are some thoughts on ‘Brexit’ (British exit from the European Union), which is the subject of a UK referendum to be held on 23 June 2016. I’ve added a discussion on implications for vaping and the TPD. My view… there is a lot to dislike about the EU: it can be unaccountable, incompetent, over-reaching, arrogant, lawless, captured and dishonest. The more you have to do with it, as we saw recently with the EU Tobacco Products Directive, the more appalling it looks. We witnessed the unedifying spectacle of the amateurish drafting of incompetent but irreversible legislation that will affect millions with no apparent concern for science or evidence while blatantly disregarding even the modest procedural requirements of the EU treaties to consult, prepare impact assessments and minimise burdens. Is anyone accountable? If everyone is, no-one is. So why am I in favour of the UK remaining in the EU? Why Eurosceptics should vote to stay in (the 30-second version)… many people are in favour of leaving the EU because they don’t like the EU – fair enough. But they are implicitly assuming that Brexit would remove what they dislike. This is unlikely to be the case. The reality of Brexit would be formed through the suffocating mechanics of trade negotiations, not by walking away from trade relationships. Powerful interests such as major employers will favour maintaining the status quo to the greatest extent possible, and this will push us towards a form of exit that actually looks like entry to the European Economic Area and the European Free Trade Agreement – “the Norway option”. The EEA comes with everything that euro-sceptics dislike about the EU, but no influence – so it is worse than staying in. 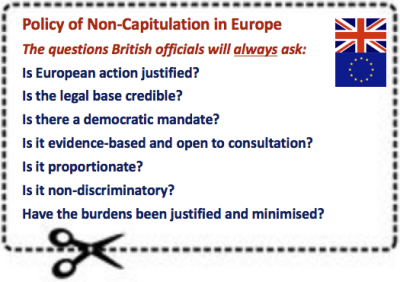 A far better approach for Eurosceptics is to remain in and argue for reform from within, through rigorous application of the principles of the EU treaties – a Policy of Non-Capitulation in Europe. The alternative is far worse – severing ties with the EU completely, and inflicting massive self-harm economically and politically. With Brexit, so the argument goes, we will be free of Europe’s asphyxiating bureaucracy, ludicrous rules, and wasteful budget contributions. Unwanted foreigners will disappear, and the flow of useful plumbers, builders, hospitality workers and fruit pickers opportunistic economic migrants will cease. Our trading outlook will be global, our parliament will be sovereign, our borders will be secure, and we will once again punch above our weight in international affairs. Hateful EU legislation will be consigned to a giant skip outside the Palace of Westminster where our newly empowered and democratically accountable representatives will toil over refashioning UK regulation along liberal, small-government lines. We will be victorious, happy and glorious, and the EU will no longer reign over us. God Save The Queen. Hmmm… the problem with Brexit is that it is very unclear what it will actually look like in reality: “we just don’t know the counterfactual. No-one does” as a civil service friend put it while we were discussing it recently. I know the statement above is a caricature, but we can be certain of one thing: Brexit in reality will look nothing like the visions of the Brexit enthusiasts. A tale of two Nigels: even Brexit supporters differ radically in their expectation: some want a buccaneering free trade liberalism (Nigel Lawson), other a more protectionist Little England (Nigel Farage). Which is it? The trouble with not having a clear view of Brexit looks like it has allowed opportunistic politicians (or the cynically self-interested) to paint their own dreamy utopian ideas onto a blank canvas, notably the odious Boris Johnson (see Liar, conman – and prime minister? – Nick Cohen and here, here, and here). To get a feel for what Brexit will actually be like, we need to sense how the various negotiations would play out in reality. Those negotiations will be a Herculean bureaucratic undertaking (see UK govt guide) thrashed out in grim negotiating rooms between people under orders not to give an inch and unhappy to be there. Some call this ‘Project Fear’, but as Anatole Kaletsky points out in Prospect, there’s a lot to be said for being fearful of things that will hurt you. Ukraine will progressively adapt its technical regulations and standards to those of the EU. Future negotiation of an Agreement on Conformity Assessment and Acceptance of Industrial Products (ACAA) will provide that in specific sectors covered by it trade between the Parties will take place under the same conditions as between the EU Member States. So a bilateral trade agreement could be anywhere on a sliding scale – with EU single market access and obligation to implement EU regulation moving together. So what will it look like in reality? So let’s just think how that will play out. We could just ignore the EU and look outwards, but that’s not going to happen. 45% of UK exports go to the EU, so we will have a massive and potent lobby of firms and workers who depend on trade with the EU, and they will be pressing the government to retain unfettered access to the EU single market. We also have firms with complex supply chains spread across Europe and staff spread throughout the EU – think of Airbus or Toyota – how would they be helped by a trade barrier between the UK and the rest of the supply chain? This compares to the currently non-existent lobby of hypothetical future businesses and jobs that might arise if we one day rustle up more business in India, Indonesia or Indiana somehow because we left the EU – even though nothing stops this business now. So the government will be under immense asymmetric pressure to keep our access to the EU pretty well as it is – and strike the bargain at the high-access, high-regulation part of the sliding-scale of choices (i.e. favour something like the European Economic Area). 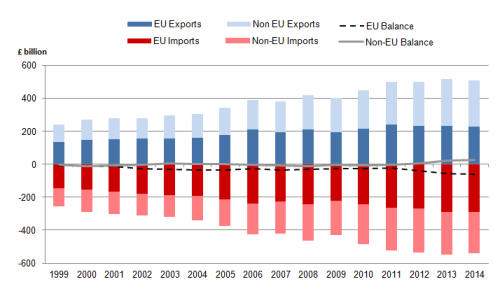 And remember, Germany trades very successfully with the rest of the world while being inside the EU – the problem with UK lacklustre trade performance is not down to the EU. And so let’s take a look at where business stands. 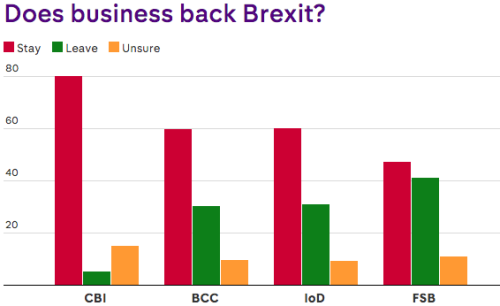 Channel 4’s Fact Check service surveyed the polls of business opinion: FactCheck Q&A: does business back Brexit? No, business does not back Brexit. By a big margin, it wants to stay in, especially big business but all sizes too – the CBI’s considered view described here: Brexit: the business view. And note this is not the special pleading of the City of London, but the nation’s major employers. So in the event of Brexit, what will this powerful lobby do? It will try to keep things as much as possible the same as staying in, which is its real preference. So they will favour something like membership of the European Economic Area. It would be a brave government that ignored the nation’s employers and raised barriers to trade with Europe – Old Etonians putting the workers to the sword. That’ll go down well in 2020. Actually, Britain’s global speciality is in services – what Britain needs is more single market, not less – we have been pushing for more effort on the single market for services for years. We would be abandoning that. Also, trade in services usually means more migration as services are delivered by people and rely on expertise. Thousands of pages of EU legislation have been agreed under European Communities Act 1972, and everything else from Brussels is grounded in other primary legislation or applies directly. My guess is a tweak will be made to the European Communities Act, so that everything agreed under it in the past five decades stays on the statute book by default. The only laws anyone will be willing or able to change will be those that have to be changed – i.e. those necessary to disentangle the UK from the EU and to reset relations with third countries – and that could be a lot. But where might we want to do away with hated EU regulation? When the Cabinet Office reviewed EU law in the UK (Balance of Competencies Review) – unsurprisingly, they didn’t find too much to dislike. I say unsurprisingly, not because there isn’t incredibly poor EU legislation, but because our officials and ministers negotiated and agreed most of it. They were marking their own homework and awarded themselves a gold star. So, remember, the bureaucratic substrate in government departments will defend their record in agreeing on past legislation. So they are unlikely to open the drains and start with a blank slate. The official starting point is: there isn’t much wrong with EU regulation (because we wrote most of it). So why would they negotiate away access to the EU in order to change regulation they aren’t that concerned about? If we aren’t going to change that much, why not join the European Economic Area? So as we turn our back on Europe we will no longer benefit from EU bilateral trade agreements and will have to start again with the countries that the EU has agreements with – either in force or under negotiation (there’s a lot of those). Whitehall does not have the capacity to renegotiate all the hard-fought EU bilateral deals currently in force and the counterparty nations are unlikely to see it as a priority to negotiate bespoke deals with the UK (e.g this one between EU and Canada runs to 1,600 pages) and the Americans say they have ruled out a UK-only trade deal. They might opportunistically use our weakened position to push against some forms of protection we have ‘enjoyed’ in the EU or to reinstate protectionist measures they removed in negotiations with the EU. Would our bilateral agreements be better than the ones we have through the EU? I very much doubt it. Luckily, many trade agreements are available to members of EFTA, the European Free Trade Association (Norway, Iceland, Liechtenstein and Switzerland) – so I suspect UK will try to rejoin EFTA. We will also find it difficult to negotiate any trade deals until our arrangement with the EU is settled and our obligations as part of that agreement are clear. The chances are we’ll end up signing agreements almost the same as the EU would negotiate anyway. Agreement with the EU that gives open access to EU markets will also require membership of the European Union customs union (like Turkey). That would mean the UK will not be able to negotiate bilateral free trade agreements with third parties (e.g. China or Canada) because these will effectively create a conduit into EU markets for the third party on terms that may not be acceptable to the rest of the EU. So the EU has a trade agreement with Canada and we’ll assume under Brexit, UK has a trade agreement with EU. It follows that UK can’t have a more liberal trading arrangement with Canada than EU has with Canada. If we wish to have full access to the EU markets with complex customs checks and ‘rules of origin’ procedures, then we will have to have the same trade agreement with Canada that the EU has – that’s just logic, not politics. These issues are particularly acute at the Irish border. We are closely linked to the EU through foreign direct investment (FDI) and the UK is attractive in part because of its foothold in the EU. The UK had the third highest stock of inward FDI in the world in 2014, behind the US and China. In 2014, EU countries accounted for just under half the stock of FDI in the UK (£496 billion out of a total of £1,034 billion, 48%). This compares with 24% from the US and 28% from other countries. The share accounted for by the EU has fluctuated between 47% and 53% over the last decade. In terms of UK investment abroad, the EU accounted for 40% of the total UK FDI stock in 2014. How does Brexit help with a decision to locate a factory in Middlesborough rather than Hungary? One advantage the UK has in FDI is the combination of English language and unfettered access to EU markets – we offer third countries a friendly beach-head from which to trade into the EU. In a vote for Brexit, we will be in turmoil from June 24th for at least two years while exist negotiations go on. Then a possible further ten years as we negotiate trade arrangements with other countries or blocs. All this time, Britain is ‘risk on’ for foreign investors. The effect of this political/regulatory risk may not emerge as existing factories closing on 24 June, but it’s the future investment decisions we should be concerned about. And what about operations that are marginal now – when companies decide where to cut, will Britain be the place to do the cuts? The political classes may think Brexit would be good for cocking a snook at Brussels, but they need to keep in mind places like Tata’s loss-making steel plant in Port Talbot – that’s one example of many places that do not need any further reasons to be closed down. The various interest groups that have grown fat at the teat of the European cash cow are all predicting the end of the world if there is Brexit. Of course, that is nonsense. I have argued at length (Buddy can you spare a trillion?) that most of what is spent in the EU budget is either a waste of money or ought to be spent within the UK and not funnelled through Brussels. There is no case for net transfers between EU member states either – that is something that should be reserved for really poor countries and disasters. But the beneficiaries, notably farmers and ‘the regions’, will argue that the losses they incur from the EU budget will have to be replaced by domestic UK spending. We should also assume that we will have to pay something into the EU budget as well. Leaving would also create a demand for UK to pay off any liabilities it has – for example, pensions or existing commitments to make future payments. The real issue is not savings on the EU budget (which are much lower than Leavers say because of the rebate and the fact that some money is spent in the UK and we would need to spend to duplicate some things Europe does for us), but what leaving the EU would do to the public finances. A weaker economy would reduce tax revenue and increase public spending on unemployment, and these changes may dwarf any savings on the budget. If you think the NHS is going to get £350m per week, prepare to be disappointed – it is the net change in public finances that determine how much more or less is available to spend on things the British public like. The estimates vary, but between 1.3 and 1.8m Brits live in other EU countries – notably in Spain, Ireland, and France. Think of these British ex-pats as hostages in the Brexit negotiations. Any rights the UK secures for them – for example, to remain where they are or to benefit from healthcare where they are, will require a reciprocal right for EU citizens to remain in the UK and benefit similarly. I can’t see any reason why we would deny ourselves the amazing productivity-boosting influx of economic migrants, but just wait until London’s professional elites discover they are to be denied their cleaners, nannies, plumbers, and builders… another powerful lobby for the status quo will form faster than you can say “dzien dobry”. What will we do about those sectors of the economy that rely on migrants – fruit picking, farming and food, hospitality, construction, some public services, and some high tech sectors, and the highly internationalised financial services sector? Yikes! Brexit could be highly destabilising refuelling demand for Scottish independence, creating a hard border between Ireland and Northern Ireland, and giving Spain leverage over the future of Gibraltar – more lobbyists for maintaining the trade and regulatory status quo. EEA here we come. Norway, basically. Humiliating, pointless, costly and self-harming. So even if you don’t like the EU – as I don’t – Brexit just makes it worse. You may be quite fed up with the nihilistic tone of all this. Sorry about that. But I think there is a better way than Brexit – and that is to become the bad-boy within the European Union. And by bad-boy, I actually mean good-boy. It just won’t make us popular with some of the more rampant federalists. I won’t bore you with reflections on what happens to UK officials and politicians when they pass under the English Channel, but there is a Brussels insider culture that is ripe for some bracing disruption. I think we place too much emphasis on doing deals – getting something agreed – and not enough on making good agreements and only where necessary. Rather than leaving, the UK should become the fundamentalists about the key principles of the EU treaties, aiming to do much less in Europe but much better. We should have a Policy of Non-Capitulation in Europe, in which we stick to the core principles by which the EU is supposed to operate. but rarely does. And if it doesn’t meet these criteria, then our representatives should always oppose it and try to win over fellow EU member states. End of story. No deals. No fudging. Not doing the deal is a win in this world. I think we would soon attract a following of liberal North and Central European states and this would point the way to a modernised, less intrusive and more respected European Union. Update: a friend suggests we sharpen this by a willingness to take PONCE-fails to the Court of Justice, on principle. I add the further suggestion that we publish legal advice if measures don’t comply. No doubt there are people who will guffaw and say we do all that anyway. But we don’t. Were any of these questions even asked, let alone answered in the case of the TPD Article 20? Emphatically no – they just can’t have been or it wouldn’t be such a mess. The approach was to seek an agreement at all costs and figure out how to accommodate all the idiosyncratic (i.e. bonkers) positions of member states and MEP groupings no matter what it meant for businesses, free trade, consumers and public health. And with one bound they were free! Many vapers hope Brexit would free them from the ludicrous Article 20 of the EU Tobacco Products Directive. I don’t think it would. Here’s how I think it would go. We are likely to negotiate a settlement that requires compliance with single market regulations. So we could leave the EU and still have the TPD, with no say on its future. This is not certain but the most likely outcome in my view (see above). Whether we exit or remain, the most likely outcome is continued TPD compliance indefinitely through some arrangement like the EEA. Even if we don’t have to have the TPD after Brexit, we will definitely have it over the crucial next few years while our exit is negotiated (process). The EU Tobacco Products Directive comes into effect 34 days before the referendum and would remain in force while we negotiated a withdrawal agreement. The treaties cease to apply when that withdrawal agreement enters into force or no later than two years after notification. There are two possible flexibilities in this – the length of time after the referendum that UK notifies the EU and extension of the two years by agreement with the other member states. So we will have mandatory TPD compliance for at least two years and possibly much longer – any damage and rationalisation of the market will take place over that period. Even if the UK can change it after a few years, I doubt we will. Why would this be a priority in the UK when Parliament is likely to be jammed up with legislation that has to be changed and civil servants and ministers overwhelmed with sorting out more pressing exit conditions? Even if we could change the TPD and did, would it make much difference? I doubt it. Tobacco/nicotine policies have a habit of going in one direction only and being indifferent to evidence. Look at the snus ban, for example – supported by the UK. The UK is now among the more progressive voices on tobacco harm reduction – its influence would be lost on a subsequent reform of the TPD. If we have to comply anyway (by law or by default), we really need more progressive voices in the room as this directive evolves. Rescued by the European Parliament… Among the worst ways to regulate e-cigarettes would be to treat them as medicines – doing this would have wiped out almost all the market leaving a few tobacco companies standing, with products designed to please regulators rather than customers. Yet this was the policy of the UK government from 2010-2013. But the only reason we don’t have mandatory medicine regulation for e-cigarettes in the UK is because this policy was reversed in the European Parliament on 8 October 2013, after a brilliant pan-European lobbying campaign by vapers. Unaccountable UK… The UK was planning to adopt medicine regulation irrespective of the EU but was influential in promoting medicine regulation as the EU regime of choice for vaping. Our own Westminister parliament would not have even been asked (and if it had been asked, it would have agreed): it would have been an administrative decision by the MHRA to interpret the Medicines Act to apply in this way. And as noted in the comments, the UK has a poor record on drug policy more generally – see this critique of the New Psychoactive Substances Act. Why is the tobacco products directive so poor? One reason, perhaps the main reason, why the TPD is so dire is that the entire deliberative legislative process was consumed and wasted arguing over the UK-promoted and the Commission-adopted idea of regulating e-cigarettes as medicines. The efforts required to overcome fundamental misunderstandings meant there was no space to discuss what should be done in a rational regulatory regime – and the actual TPD Article 20 was all cobbled together in few secret amateurish political meetings after the medicine proposal was defeated. Responsible member states should have pulled the e-cigarette proposal out of directive and called for a careful rethink. Where was the UK urging caution and moderation? It wasn’t. 35 comments to Brexit: utopia, dystopia or PONCE? I note the almost instinctive distaste for the idea of a federal Europe, but how many peop’e have spent time in a federal state? In some ways a proper feral state ccould give member states guaranteed rughts, and perhaps ,lre rognts than individual states have uner the present treaty arrangements. just a thoight…. Just read this Clive and I can clearly see how you have arrived at your conclusions. Isn’t the real issue not staying in or out but what the EU is already and what it will become in the future? How many of “us” would actually agree to join the EU as it is now for the first time? There is of course another scenario that you haven’t considered and that is that Brexit actually causes the breakup of the EU with other countries then holding referendums. As you highlight the motive and influence of many is free trade so perhaps Brexit begins the demise of the “political” EU and morphs into a whole new EU trading bloc without the political entities. After all the biggest concern is undoubtedly the lack of democracy within the EU and the “EU state” becoming more and more powerful to the detriment of member states. Survey: How will EU attempts on vaping affect your vote? Exactly! It needs a major culture change in the UK – and whilst I wish that I believed that this might happen, I have great difficulty in doing so. It COULD happen (i.e. its not technically impossible) but WILL it??? Sorry to be such a pessimist, but 60+ years of life experience tends to support the pessimistic view, rather than the opposite. On a slightly different topic – to show that I can see the bright side sometimes! – I just want to say a wee “Hurray” for Wales, for not voting in their silly “where you cannot vape” rules. Pity they bundled those with some worthwhile stuff, but at least vapers there can breathe a small sigh of relief…for a little while. Maybe, by the time the Welsh Parliament get around to considering these bans again, they will have gained a better understanding of how little risk vaping poses to anyone. And I also wanted to say another small “Hurray” for TW’s petition passing the 90,000 mark! …. And to ask whether you are aware of any reason for the delay in the EU Court’s decision on the TW legal challenge to the TPD? Wasn’t it expected in January??? Well I disagree that it can’t or won’t happen. But I don’t believe there are quick fixes for this, it would require a sustained culture change – but that starts with us, the UK acting differently and being much more rigorous. That needs the Prime Minister, Chancellor and/or Foreign Secretary to start giving the right signals about how we engage in the UK. It also means that Westminister needs to do more scrutiny of UK engagement in the EU against these PONCE principles – which do not require treaty changes, just taking seriously. I strongly sympathise with Xbow’s comment above. I thought the original aims of the EU, when we joined it, were: closer trading relationships, easier travel across European borders and perhaps some form of common defence policy. I never signed up for the concept of “ever closer political union” with the rest of Europe – which is now a declared EU goal. Whilst I have sympathy with the views that you put forward in this article, Clive, I just cannot see our politicians (except for Farage, perhaps) becoming the “bad kids” on the EU block – they certainly have no history of such disruption. I doubt they will ever stop squabbling amongst themselves for long enough to co-ordinate any concerted action in Europe! Leaving the EU at this stage would be neither easy or simple, and I can see that there are arguments on both sides that need to be thought through carefully before we vote. But I do hate the way the EU operates at the moment – and the sorts of reform that you suggest that the UK could fight for should we remain “in” seem to me to be both desperately needed and desperately unlikely to happen. Interesting as always, Clive. I would be voting to stay in, if Europe (or rather, the EU) were honest. Without doubt, if we vote to remain, ecigs will be illegal throughout the EU by next year. There’s that nasty little clause that says if 3 member states vote to ban them, we all follow suite. 3 out of 28, and no recourse. So which countries are tobacco producers, home to big pharma, or cigarette factories? As a trade organisation, fine. As a supranational government, no. DC’s “deal” will be ignored if we remain in, as on past performance, the UK is generally ignored, seat at the top table or not. I for one am willing to take “a leap in the dark” to see if the EU looses some of its arrogance; Then there may be some progress. I use ecigs as a sample of the grim legislation that passes for democracy because this is one subject I know a little about. God knows what else sneaks through unnoticed. I think maybe loosing the UK (and it’s funding) might just give the beaucrats a healthy dose of reality. But my point is that the directive is likely to apply anyway – at least this ought to be the working assumption of Brexit voters based on the power of the lobby for the trade status quo. Obviously, with the UK without influence, it cannot play a role in restraining the excesses of the more zealous prohibitionists. I have to apologise for my comment on PONCE. After I cleared the tears, and read it again, I realised it is a serious idea. But how on earth could it ever work? The idea is reforming the EU from the inside. This idea seems to be popular with those who wish to stay in and people are dreaming about how they are going to do it. It’s a dream because we all know the EU is a seriously nasty thing. Reform? Never going to happen! The Lisbon treaty (Rome) “Any Member State may decide to withdraw from the Union in accordance with its own constitutional requirements.” Sounds easy? But in fact the actual treaty makes it SO complex, it becomes formidable! The EU MAKES it formidable – natch! The best “bad boy/good boy” thing WE can do is have a VERY LOUD referendum about leaving because we are the only Member State to even vaguely contemplate it! Courageous indeed. It’s the most exciting thing in politics for me since the fall of the Berlin Wall and Democracy for South Africa, which happened almost simultaneously. Heady days! I hope I’ll be around to watch Tobacco Control fall, and the UK become a democracy once more. Two falls, two democracies, would be a very good life! Thanks Clive, for your post. Seriously! PONCE is a serious idea! I actually think the treaties are pretty good in many ways, liberal commitments to four freedoms, and a commitment to make these work by harmonising laws through shared sovereignty. It’s just that they are routinely misused to press interest-group agendas (that wouldn’t change if we left and we’d still be exposed to it). So PONCE is intended as a shorthand guide to the main principles that are supposed to underpin EU decision-making. Every single one of these was abused in making the TPD – and we, the UK, were complicit and active in that. Getting our own approach right is where EU reform should start. Then we seek the support of others. And gradually, the EU reverts to something resembling a free-trade area, a basis for co-operation on security and justice, and a way of acting collectively in global matters. Certainly a more thoughtful analysis than most. There is one aspect of this that you don’t seem to have considered though. The clear direction of travel in the EU is towards greater centralised power, with many key players supporting a greater political union, with a seeming end game of a federal Europe. There have been discussions of an EU armed forces, unthinkable now, but so are most policies when initially proposed. This doesn’t really matter under PONCE, provided that UKG is, as now, tepid in it’s support for the idea. Under a pro federal UKG, PONCE suddenly looks like less of a viable strategy, and more of a sword of Damocles. Taking a long term view (i.e. beyond the next couple of general elections), isn’t the question of a federal Europe really the key issue? If we stay in, we are, regardless of how much noise we make about it, tacitly supporting the concept and, if we don’t abandon the leaky raft that is the EU now, will it ever get easier, or only more difficult? Thanks for this… yes the direction of travel is an important question: and is this towards federalism? I suspect the direction of travel is towards what bureaucrats sometimes call ‘variable geometry’, in which there are different degrees of integration or federalism. We already have this with the euro-zone and Schengen. I think for the euro currency area to survive, the direction will have to be greater integration, though I am unsure that the electorate in either the stronger or weaker countries will buy that. I would like to see some aspects of EU extend to countries who are not members – maybe through an associate membership of some sort – e.g. for Turkey, Ukraine, Georgia etc. I think euro-scepticism is on the rise everywhere in Europe – and ultimately they will respond by limiting what Europe does to what its citizens are happy with. My view is that we, UK, should be part of that, and not have it done with us half in (access) and half out (influence). BTW – I think there are good arguments for some military cooperation / integration. For example, peace-keeping missions, humanitarian disasters, responding to genocide etc. I presume PONCE is a joke in every way. You are not serious? Ponce means a man who lives off a prostitute’s earnings. About right? Very funny. I enjoyed! “one of the stupidest, most dangerous and unscientific pieces of drugs legislation ever conceived. Watching MPs debate the Psychoactive Substances Bill yesterday, it was clear most of them hadn’t a clue. They misunderstood medical evidence, mispronounced drug names, and generally floundered as they debated the choices and lifestyles of people who are in most cases decades younger than themselves. Assuming that getting rid of the EC will make everbody feel high is a bit dangerous,no? UK political parties have been terrible on vaping and would have been quite happy to use this issue to burnish their tough-guy public health credentials by banning or over-regulating vaping. It’s only very recently that the light has dawned – and this follows a shift in the position of some critical public health organisations here and the long-standing ‘harm reduction’ tradition among the most prominent academics. The key is to achieve a shift in the positions of people who influence politicians. The same applies to drug policy, which is even more deeply mired in failed prohibitionist strategies. Clive a mate rekons you are too pessimistic, others seem to think you are too optimistic, guess that means you are ,probably ‘ just right’.God knows. The bigger question is given the unrelenting and hopeless, steady decline in Europes significance, is being part of it worth it?? The pessimists may be right – but I think we have to think about what options there are in reality to make it better. The issue around the UK leaving the EU, would not exist if the UK had the leadership role, it feels it deserves. It is the needs of The City of London, that are being served. Even Cameron has declared this to be the case. The EU is a sinking ship, and there are not enough life-rafts. Dependent states will be the last to leave. I think the City is an important consideration (it’s a massive thing for UK/London) but far from the only thing that matters. Cameron’s ‘deal’ protects the City from arbitrary and capricious decisions made within the euro-area. Something we may lose if we leave, but remain obliged to comply with its regulations – as I’ve argued in the post, that’s the most likely outcome of Brexit. Your proposals are wonderful, Clive. The only problem is that the UK has failed to block any proposal from the EU Council from becoming law, ever, and the 72 statutory proposals we opposed have all become law. None of its murderously corrupt laws will ever yield to any moderate persuasion efforts. The EU is what it is: a vast, stinking cesspit of corruption. The only way to fix a problem on that scale is to leave it. Your suggestions that change can somehow be brought about are ridiculous. Please do not insult us. I respect your motives and your projections, which are probably accurate. Nevertheless, suggestions that a turd can be changed to a diamond by magic are unrealistic. Staying in an abusive relationship is the worst possible choice, made for all the worst reasons, and leads to the worst possible outcome. A more reasonable suggestion is that if enough states leave, alternative situations present that can be leveraged. It’s not an overnight fix but these are all 40 year issues anyway. That may be true of votes, but things get either stopped before a vote or changed beyond recognition so that a vote is successful. The Council tries to work by consensus so qualified majority votes that are defeated are rare. I don’t share all your pessimism about reform in the EU. Our referendum is a loud signal… but there other factors: the North-South stress in the Euro area, tensions in Schengen, rise of the nationalist parties etc. that are troubling EU leaders. They also know they can’t carry their own electorates – look at Ireland, France, and Netherlands referenda for example. But my main point is that we will inevitably gravitate to something like the EEA/EFTA status, and we’ll have the EU but without any influence – and that definitely will not help us. Another point Chris… who is the ‘us’ I am supposed to be insulting? It’s a bold commentator who claims to speak for everyone. And I don’t think I’m insulting anyone by presenting my views and how I see this issue – based on my experience. You might not like what I have to say, but my main point is that under Brexit, we’ll still be in it. The debate about Brexit is conducted in breathless rhetorical hyperbole, but the reality will be formed in the suffocating mechanics of dense trade negotiations. So the EU is a lot like the Hotel California, you can check out anytime you like but you can never leave. I think you are right on all counts, delicacy the odds of a punishment beating if brexit happens. Seeing how Ireland and Greece were treated ( cheered on by brexit supporters ironically) by the EU shows how forceful it can be if opposed. Unfortunately that same resolve is their to oppose any reforms as well, I doubt the U.K. can muster support from states that benefit from things as they are or from states that depend on the support of the EU to advance reform. It really is a loose loose situation. However the fact of brexit even being run as an option must be giving the EU pause for thought, perhaps it might be the fright that’s needed to at least make reforming the EU a dim possibility. I think they have a lot of reasons to pause and think… the UK leaving won’t help with that, and we would be better as a force for change from within. I agree with your Hotel California metaphor – we will not be able to decouple in they way that many assume. I think Brexit will end looking like EEA/EFTA – access with compliance but no influence.